RASRL was named for Romanzo Adams who was hired to teach economics and sociology at the newly founded University of Hawai‘i in 1920. Adams had no particular expertise in race relations when he arrived in Mānoa from the University of Nevada. He was, however, a skilled demographer and once in Hawai‘i was called upon to help document Hawaii’s rapidly changing population. By the end of the early 1930s, the sociology department was recognized locally and nationally for the work Adams and his younger colleagues – Andrew Lind, Clarence Glick, and Bernhard Hormann – were doing. Adams wrote one of the first research monographs published by the University, “The Education of the Boys of Hawaii and their Economic Outlook: A Study in the Field of Race Relationship.” He and his colleagues regularly spoke to the annual conference of social workers, taught extension courses for general audiences, and editorialized in the local newspapers. 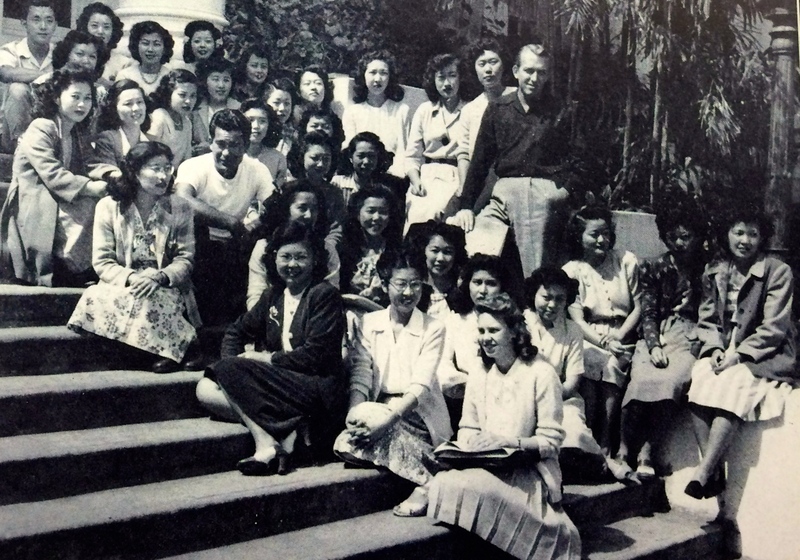 In 1927, the University received a grant from the Laura Spellman Rockefeller Memorial fund to study race in Hawai‘i, more than $200,000 over the course of a decade.⁠ A portion of this funding allowed Adams and his colleagues to hire graduate students, research assistants, and support staff to collect and organize faculty research and the papers submitted by sociology students. Because the earliest papers in the Collection date back to the early 1930s, it obviously did not take long for the faculty to recognize what a valuable resource they had in their students. Early papers include: “A Sociological Study of Kakaako” (1929); “Papakolea” (1930); “Social Attitudes in the Kahahawai Case” (1932); “The Japanese Theatre Crowd” (1933); “A Study of Waitresses” (1936); “The Lei Makers of Hawaii” (1936); and “A Study of the Japanese Dressmaker in Hawaii” (1939). It is apparent that the students approached these assignments with seriousness and took some pride in their work. In spite of the fact that these were written by undergraduates, they can be surprisingly thorough. What they lack in theoretical sophistication they make up in enthusiasm and attention to detail. The RASRL writers were local. The University charter specifically prohibited exclusion of any student based on race or gender; intellectual aptitude and the ability to pay were the only criteria for admission. The student body reflected the ethnic diversity of the Territory and the demographic trends of the era. They were, for the most part, of traditional college age (18-24) but some were older, students who returned to school after time spent earning a living or beginning a family. Beginning in the 1930s, students who were the wives or children of military or defense workers as well as soldiers and veterans began to attend UH. Although the earliest graduates of the University were privileged (socially, if not economically) the university population very quickly encompassed students from across the social, ethnic and economic spectrum of the territory. As such, the RASRL Collection contains information about people and groups from every strata of local society. Community studies of the type that are featured in this Collection were done in many universities across the country, especially those staffed by graduates of the University of Chicago. 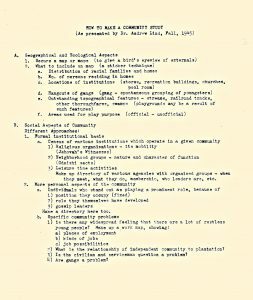 The “Chicago School” of Sociology (as it came to be known) had a particular interest in race and race relations especially in urban environments. Students and faculty conducted surveys and gathered sociological data that became the basis of some of the most important sociological treatises published in the early 20th century. 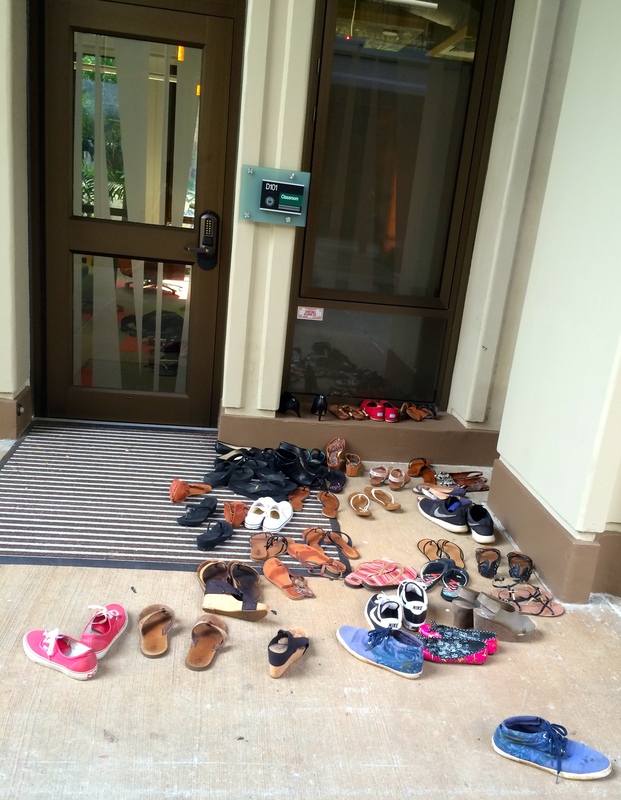 These students were an invaluable resource for sociologists interested in race relations because they were able to do things their Haole professors could not: interview residents in Chinese, Japanese, or “pidgin,” or walk through the neighborhoods inconspicuously. As members of the communities they observed they were able to provide an insider’s account of life in Hawai‘i and contribute information that couldn’t be obtained through traditional methods. 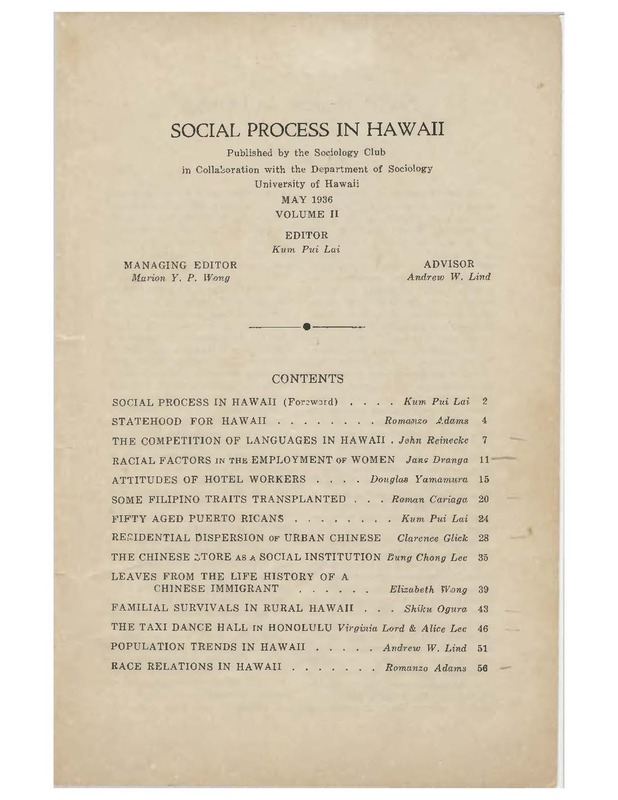 Some of the papers were included in Social Process in Hawaii, a journal published annually by the members of the student-run Sociology Club. 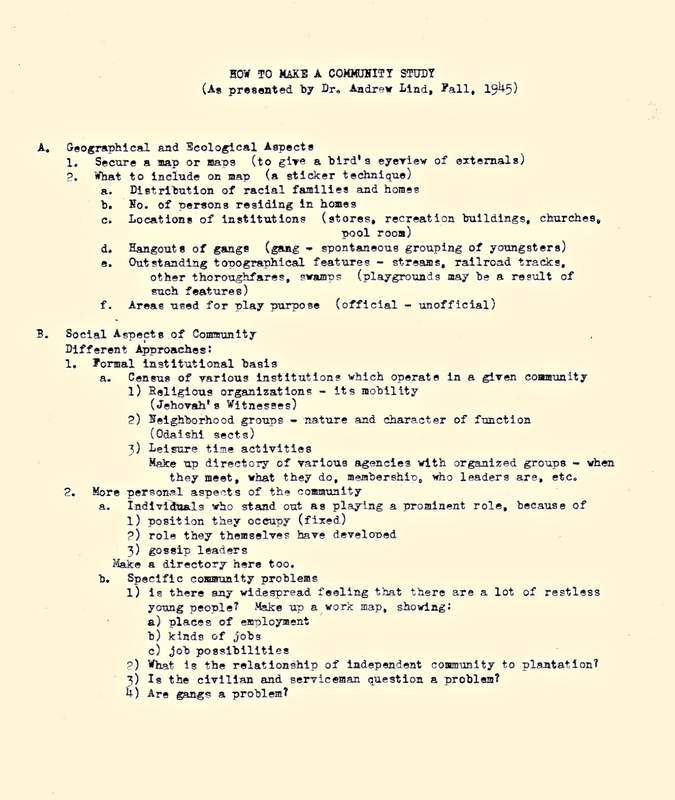 Social Process, which was published from 1936 to 1963, featured articles of interest to local and national audiences. 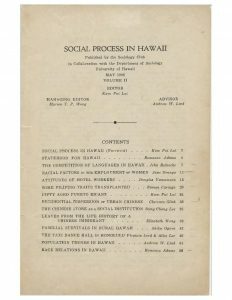 For local business and political leaders who monitored labor, education and other social problems, the journal was the only source of objective scholarship on contemporary social issues in Hawai‘i. Sociologists from other universities in the United States who studied race relations and the “second generation problem” not only read Social Process but came to Hawai‘i to do their own research and access the work already done by the RASRL writers. 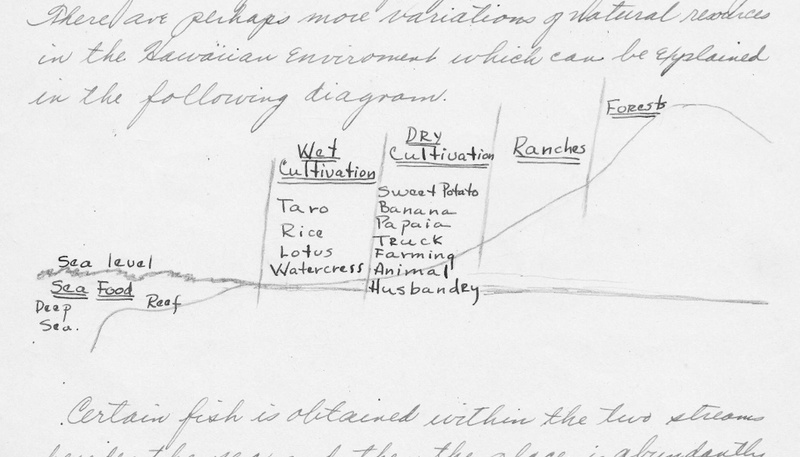 The RASRL collection contains thousands of papers and hundreds of maps. What is on exhibit is only a tiny fraction of what is available. We chose items that were visually arresting because of their uncomplicated charm and artistry (Kaimukī) or intriguing because of the types and amount of information and level of detail they provide (Hale‘iwa). The maps come in different sizes. 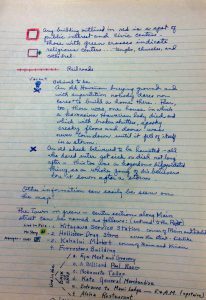 Those that were part of ordinary student assignments, from an introductory class, are usually on an 8 ½ x 11 piece of typing paper or a 11 x 17 paper folded in thirds and glued into the binding of a notebook. These were usually the product of a single student who had undertaken a study of a neighborhood or plantation town. “Juvenile Delinquency,” “Cases of Venereal Disease,” and “Residential Distribution of Teachers” are much larger – 2 1/2 feet by 4 1/2 feet. They were probably produced by a team and, because of the scope of the study, probably required the assistance of faculty or graduate students. These larger maps document social problems or illustrate changes in the community and may have been used as part of public presentations or in the classroom. When they are preserved together, the map and paper are in conversation with one another. They communicate to the viewer in a very straightforward fashion – what you observe in the map is explained by what is in the text of the paper. 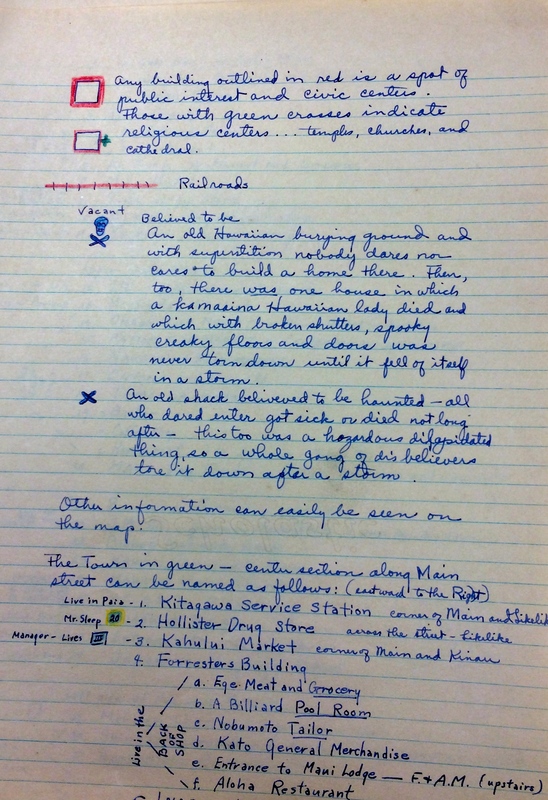 These maps might reveal something about the author – he has good penmanship; she has an artistic flair. The maps that were drawn free hand, without an overlay of a professionally drawn map, are sometimes beautiful – enhanced with color and what might seem like unnecessary detail – the trees that run alongside the highway or the names of all the shops along the main street. They tell a story in a way that the papers can not. This is in part because they are largely silent, making only limited use of words to communicate. Interacting with them can be disorienting – we look first for something that can explain what we’re seeing: a title, a date, a name. Sometimes a mapmaker includes a key that literally unlocks the signs and signifiers, color coded dots to designate ethnic groups, crosshatching to distinguish public from private land. But without words, we are left to orient ourselves, to provide our own context by asking questions. The viewer has to find her own way, make guesses, look for patterns. She has to make things up, test an idea to see if it works, find the information that makes her idea feasible, if not accurate. These maps tell stories, but not always the ones we think they are telling. Or the ones we want to hear. The maps raise more questions than they answer and are, therefore, quintessential primary sources. They provide an opportunity to consider how students and faculty interacted in the production of knowledge. They force us to question the sensibilities and priorities of social scientists who viewed Hawai‘i as a laboratory and Hawaii’s residents and communities as specimens. 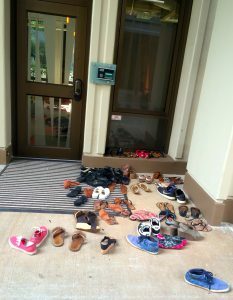 They both challenge and reinforce our pre-existing knowledge about Hawai‘i by viewing it from the point of view of the students, local residents who were intimately attached to the place but asked to view it from a distance as dispassionate observers. They are preserved as archival records, an invaluable resource and a unique repository of local memory.